A good night of sleep is key to a good day. But when you lie in bed with aches and pains and a restless mind, good sleep can be impossible to attain. 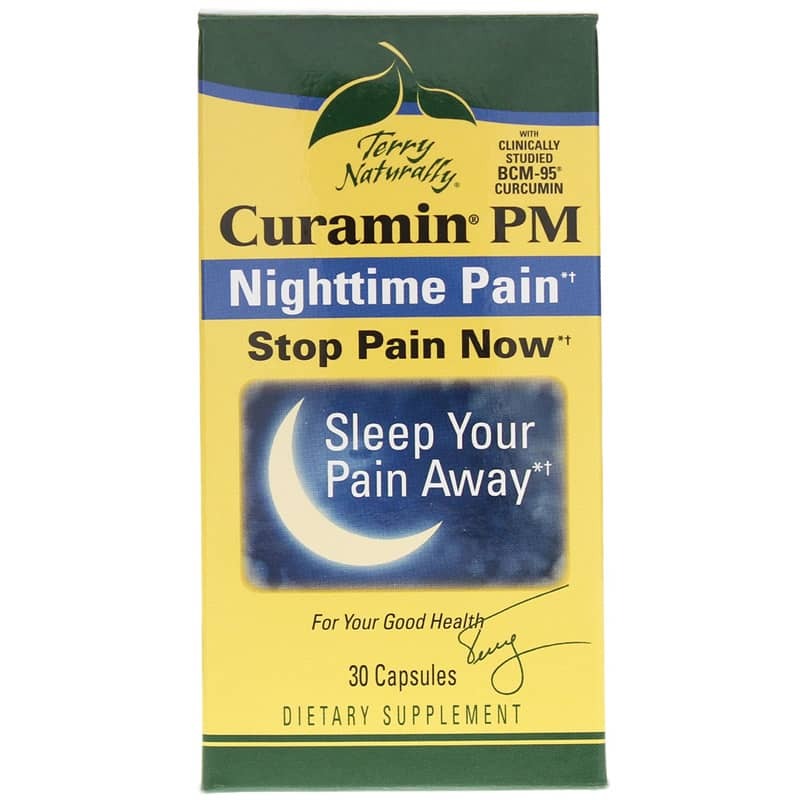 Put your body and mind at ease with Curamin PM by Terry Naturally. 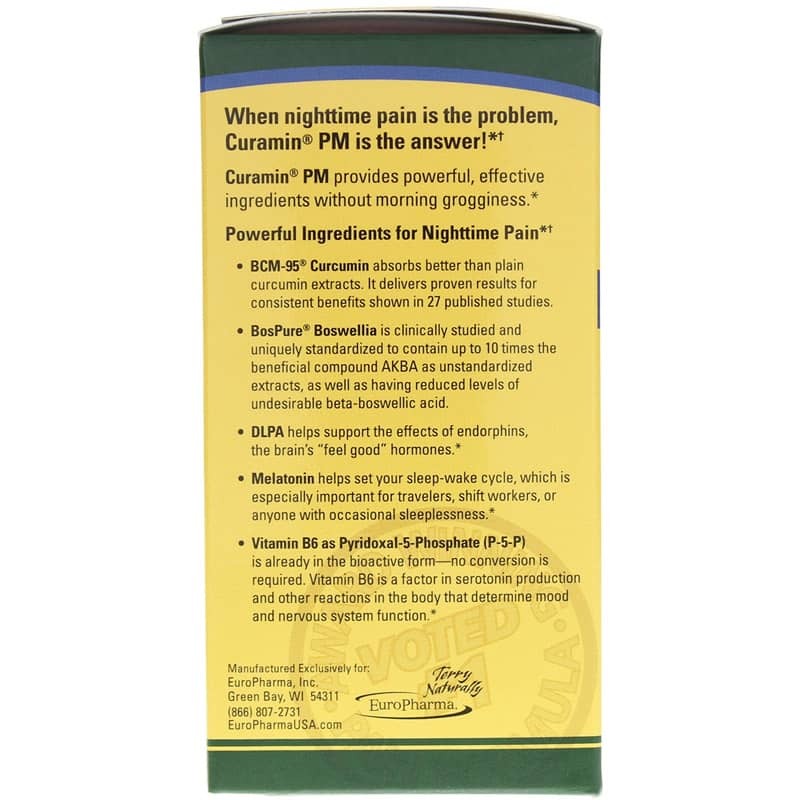 A unique, fast-acting formula, Curamin PM provides the support of a curcumin supplement with a proprietary blend of curcumin and boswellia for pain, while added nutrients like melatonin and DLPA help ease the mind for the support you need to have a restful night. 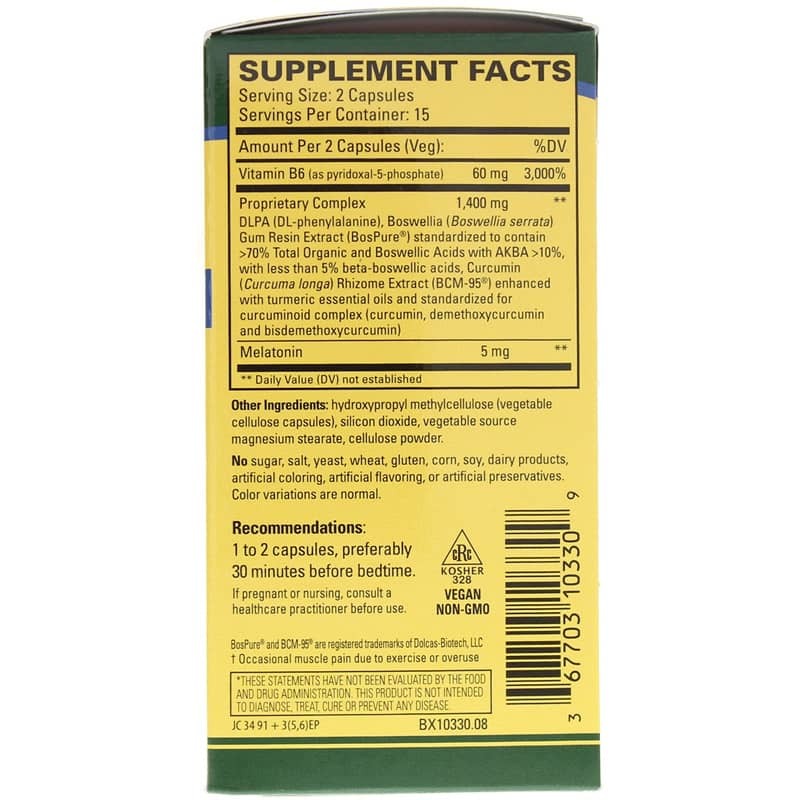 Curcumin and Boswellia - Working together to support healthy natural responses within the body, curcumin and boswellia inhibit different problematic compounds in the body to help you feel less pain. DLPA - This mood-supporting amino acid may help inhibit the breakdown of enkephalins - compounds associated with positive mood and support for muscle pain due to exercise or overuse. It may also support the production of tyrosine, which is needed to produce norepinephrine and dopamine. Vitamin B6 - B6 is also useful for supporting mood and mental well-being needed for a good night of sleep. It may also be linked to serotonin production and other actions related to mood. Melatonin - This hormone is essential for determining sleep and wake cycles and may be beneficial in support healthy sleep, especially among travelers, shift workers, or those who struggle with occasional sleeplessness. Together, these ingredients provide the soothing support needed by the mind and body. Feel well and sleep well with Curamin PM. Other Ingredients: hydroxypropyl methylcellulose (vegetable cellulose capsules), silicon dioxide, vegetable source magnesium stearate, cellulose powder. Adults: 1 to 2 capsules, preferably 30 minutes before bedtime. If pregnant or nursing, consult a healthcare practitioner before using. Keep out of the reach of children. I am very impressed with Curamin PM formula - this is one of the few things that works. I took the products and had amazing benefits. I'm telling my friends about Curamin. Sleep for the Holidays - or any time ! 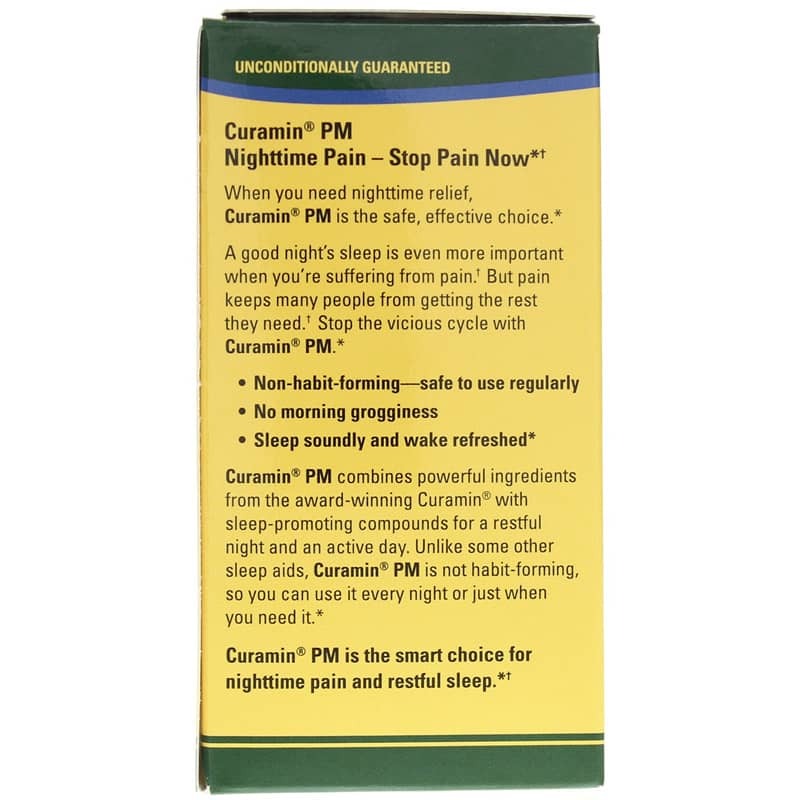 I tried Curamin PM for the first time recently - they worked and no hang over feeling the next morning ! Works better than anything else I have tried. And I have tried a lot of different products over the years. I highly recommend it. I take it every night, it works great!! !